Wahoo, there’s a new oat milk on shelves in Canada!!!! 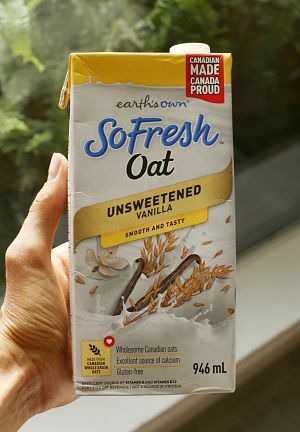 Canadian company SoFresh has just launched Oat Unsweetened Original and Oat Unsweetened Vanilla. These are the first refrigerated oat beverages in our country, developed by the Earth’s Own team in Delta, BC. They are gluten-free, nut-free, dairy-free, vegan and fortified with Vitamins D and B12. Also, each cup of the SoFresh oat beverage is made using one third of a cup of 100% Canadian oats (yay for supporting our local economy!). Three other reasons I’m excited: first, if you follow me on Instagram, you know I am a huge fan of plant-based milks. I’m constantly making all different kinds in my home kitchen. The one I haven’t yet mastered, however, is oat milk (why does it always turn out slimy for me?!). It’s nice to have a refrigerated option now available at Loblaw’s and other grocery stores nationally. 1L cartons of the shelf stable variety are also available — both versions are $3.29 for 1L and $4.29 for 1.75L. Secondly, while on vacation in Sweden this summer, I observed how popular oat milk has become in this part of the world — it’s everywhere! At most coffee shops, oat milk is the only plant-based milk option. “Why?” I asked the locals. Because it’s delicious and less expensive than other nut-based options. I hear this new SoFresh Oat Milk froths extremely well, too, making it a big hit in coffee shops here in Canada. Thirdly, for those who have tree nut allergies and have written to me asking for a reco—here it is! Today I’m sharing the recipe for the green smoothie I’ve been drinking every day. It’s made with just six ingredients. 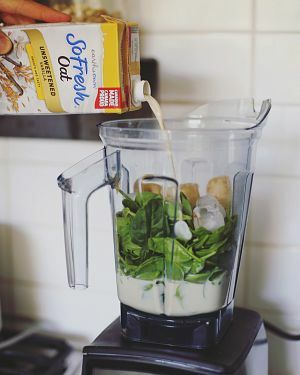 The 1 ½ cup of oat milk in the recipes packs a punch of 6g of protein, 75% of your daily recommended intake of B12 and 45% of your daily recommended intake of calcium. Hope you love it as much as I do! 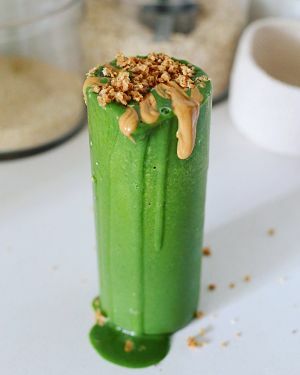 Add all ingredients to your blender and puree until smooth. If you prefer it sweeter, add a date or two. Top with toppings, if you wish. Enjoy! 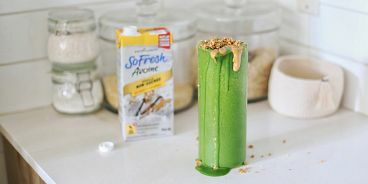 Thanks so much to SoFresh for sponsoring this post! !